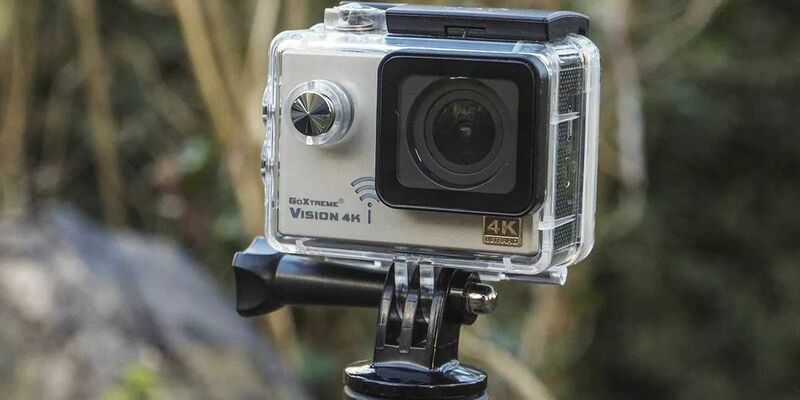 A 4K action camera for 100 quid sounds like a great deal, especially when the GoPro Hero Session – the leading brand’s cheapest 4K model – has a tiny black-and- white screen, while the Vision 4K has a colour display. To see if it’s really such a great buy, however, you have to look closer. Video shot in 4K is incredibly sharp, but it’s not the main thing you want from action footage. That’s just as well, because the Vision 4K doesn’t actually shoot 4K. It shoots one-third fewer pixels than that, and upsamples them. If that was what 4K meant, every digital camera could be ‘4K’! As we’ve said, however. 4K isn’t a priority in this type of camera, so does it matter? At this price, no. I he Vision 4K’s results at 1080p Full HD were comparable to video from much more expensive cameras at the same resolution, especially with HDR on. It also takes stills, which it shoots at 12 megapixels and (sigh) upsamples to 16. The upsampling is pointless but, again, the pictures look fine. It’s a shame that the maximum frame rate is 30 frames per second (fps) rather than 60fps. which is popular for capturing fast motion. Not everyone likes watching 60fps video though – most films and TV programmes are shot at 24 or 30 fps. Now, about that colour screen. It’s not an essential feature on an action cam. because you’ll rarely be framing shots or monitoring what you shoot; it’s more about strapping the camera to something and forgetting about it. More important is the ability to change settings quickly. The Vision 4K‘s lack of a touchscreen lets it down here, because it leaves you to fiddle with menu buttons. At least you can set it up from the OKCAM app on your Apple or Android phone, which also gives you a more convenient live view. The Vision 4K comes with a full set of accessories, including a waterproof plastic case, which makes it relatively bulky. Despite its limitations and misleading name, it’s not bad value – but remember to budget another ££ or so for a fast 64GB microSD card.